The NRSV is becoming increasingly widely adopted by colleges and Churches throughout the English-speaking world and the publication of this essential reference tool will encourage more detailed study. Over 300 pages long, this Concordance offers, in a compact volume, a key to most of the important words in this translation and will serve as the ideal companion to the already well-established and highly respected Oxford Annotated editions of the NRSV, with which it shares a common format. The Concise Concordance to the New Revised Standard Version by John Kohlenberger was published by Oxford University Press in December 1993 and is our 12057th best seller. The ISBN for The Concise Concordance to the New Revised Standard Version is 9780195284102. Be the first to review The Concise Concordance to the New Revised Standard Version! Got a question? No problem! 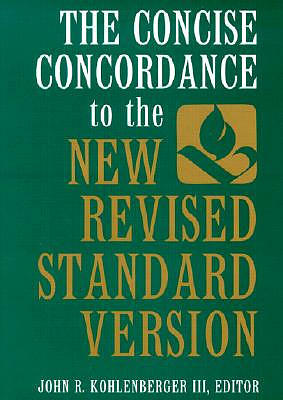 Just click here to ask us about The Concise Concordance to the New Revised Standard Version.